By watching this video, and liking Omega Appliances on Facebook, you will automatically go into the draw to WIN a brand new OVEN for your kitchen. 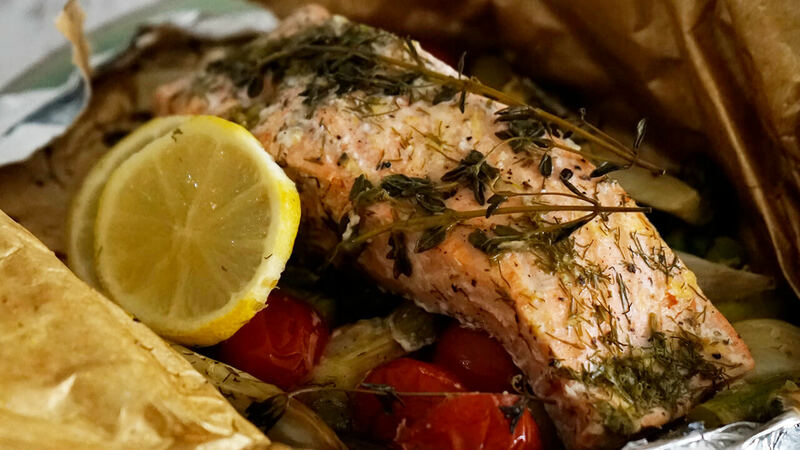 Salmon recipe with vegetables and herbs cooked in parchment. Light and delightful, this salmon recipe is a fillet cooked in parchment with asparagus, fennel and cherry tomatoes. 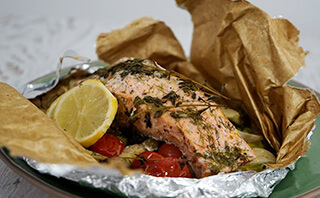 To prepare this salmon recipe, place a sheet of parchment foil on your working bench. Drizzle some extra virgin olive oil over the top of the foil. Cut up the asparagus stalks and fennel into short strips and the cherry tomatoes, in half. 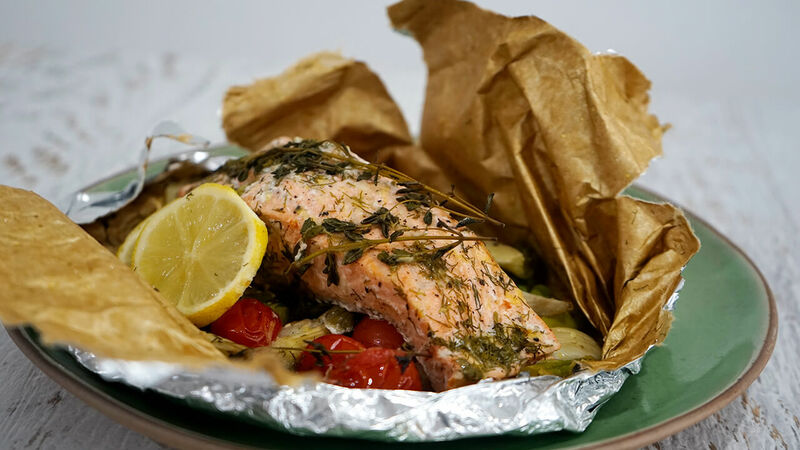 On one side of the foil, leaving room to curl up the sides later on, place the asparagus, fennel and cherry tomatoes on the parchment foil along with a small sprinkle of capers. Grate some fresh lemon rind over the top of the vegetables and add salt and pepper. Place the salmon fillet over the top and add a handful of fennel leaves on top along with some fresh thyme, another small sprinkle of salt and pepper and a little more rind. Place the two slices of lemon on top for the perfect finish. Fold the other half of the parchment foil over the top and seal all of the edges by curling them inward, making sure to leave no room for air to get inside. Place the parcels in the a pre-heated oven for 20 minutes at 180 degrees celcius. Remove the parcels from the oven and serve on a flat coloured dish or small wooden pallet. VINCENZO’S PLATE TIP: Be careful when opening the parchment as there will be a lot of heat sealed inside…it is best to open the foil with tongs but serve as it is – it will impress all! Salmon tarts are pretty morsels of seafood and vegatable goodness! 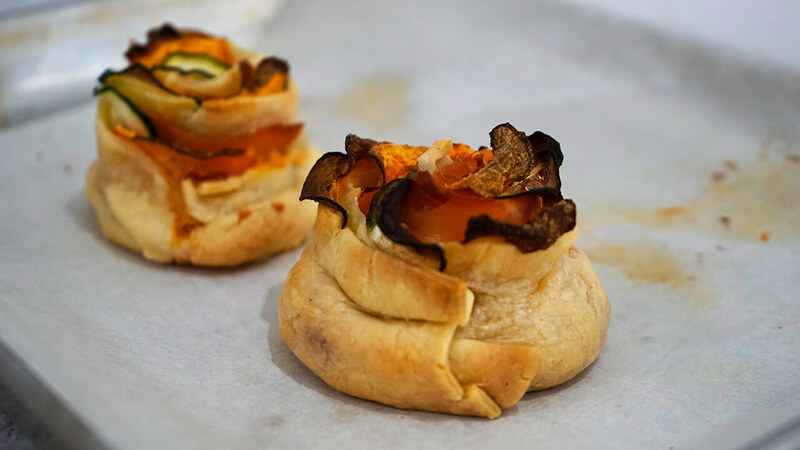 Smoked salmon wrapped in short crust pastry filled with cream cheese, sweet potato and zucchini are the perfect starter to kick off a delicious meal. You can also make a mini-version as a canape. Cut a rectangular strip of shortcrust pastry, approx. 12cm wide. Spread your choice of cream cheese on top, leaving a boarder all the way around – make sure you don’t spread the cheese too thick! Cut the sweet potato and zucchini into round strips using a potato peeler and place them on the top section of your strip of pastry, making sure they are only half way inside. Layer a few thin strips of salmon on top of the vegetables and cheese spread. Starting on one side, gently roll up the pastry keeping all of the delicious ingredients in place. Once you get to the end, stand the parcel up and place it onto a baking tray covered with baking paper. Add as many as you like to the tray, being careful they are not too close together or touching. Pop them in the oven for 20 minutes at 180 degrees celcius. These salmon tarts can be enjoyed hot or cold as a starter or a delicious accompaniment to a main. Smaller versions can also be prepared as canapes.